DAY 1-3: Arrive, transfer to Sapporo + Sapporo Snow festival! Today we head north, friends: Sapporo awaits! Upon arrival, we’ll visit the Royce Chocolate Factory inside the airport, where you can check out some of Japan’s most popular confections. After eating lunch, we’ll check in at our Sapporo hotel and head to the center of the festival in Odori Park! Here, you’ll have a chance to get some pictures of the massive snow sculptures, get awesome food, and even check out events for local anime fans on the exclusive Snow Miku stage. In the evening, we head to Susukino to marvel at giant ice sculptures before inhaling some of the city’s best ramen! Day 4: Slides, Tasty Bites, and Candelight! Today, our adventure at the Sapporo Snow Festival continues! We’ll spend our morning sliding down the massive snow slides and sampling local goodies in the Tsudome area. You may even get the chance to try your hand at making a snow sculpture of your own, or even carve a shot glass from an ice cube! After we conquer the dome area, take your pick: either ride to the canal city of Otaru for their annual candle-lit Winter Festival (and their awesome local treats), or check out more of the city of Sapporo. You’ve heard of Sapporo Beer; now go to where it was born! We’ll make a stop at the Sapporo Beer Factory this morning to check out the history of this famous brew and (if you are of age!) get some samples. In the afternoon, we’ll regroup and head towards Lake Shikotsu, where we’ll check into a luxury hot spring (onsen) resort on the lakeside. Soak in the hot spring waters, fill up at a deluxe buffet dinner, and join us for an evening visit to the neon glow of the Lake Shikotsu Ice Festival! After breakfast, we bid adieu to Lake Shikotsu and hop on an express train along the south Hokkaido coast to Hakodate. Our first stop will be waterfront’s Kanemori Warehouse area, where you can sample some of the beloved local goodies such as “Snaffles” (trust us, they’re great!) and Japan’s most legendary Gelato. In the evening, we’ll check in to our Hakodate hotel and head out for a late dinner. Today is completely dedicated to exploring Hakodate! We begin with the famous Asaichi Morning Market, home to some of Japan’s most famous fish and crab vendors. Then we head into the old western quarter of the city to learn about the city’s history, and maybe grab a little tea at the old English Consulate. After a lunch on the waterfront, it’s off to Fort Goryokaku, a unique star-shaped fort that we’ll view from the ground – and a tower outside the moat. 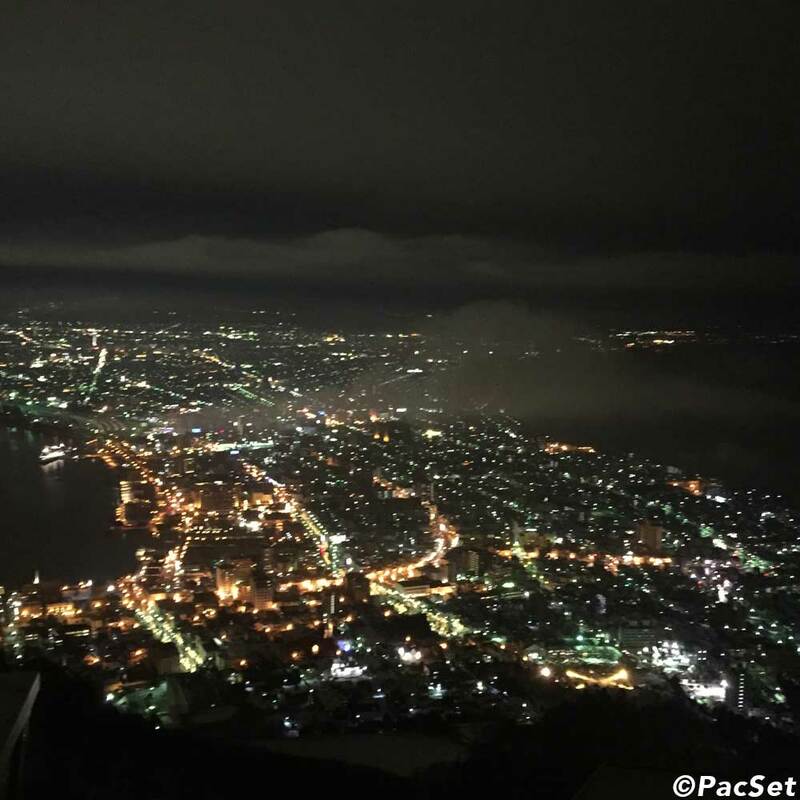 Speaking of views, in the evening we’ll head to one of Japan’s most legendary ones: the city lights from Mt. Hakodate. We depart Hakodate in the morning and travel through the Seikan Undersea Tunnel on Japan’s newest Shinkansen (bullet train). Our first stop will be Aomori, where you’ll learn about the history of the Tsugaru Strait area on the Hakkoda-maru Ferry, see amazing festival floats at Warasse Museum, and sample fresh Apple Wine and Apple Soda at A-Factory! The adventure continues in Hirosaki, where we’ll visit the breathtaking Hirosaki Castle to see the city’s annual collection of snow sculptures on the castle grounds! After checking out of Hirosaki, we’ll hop a few trains and arrive in Kakunodate, an old village in the Akita mountains where a beautifully preserved street of samurai homes await your visit. Feeling cold? No worries – in the evening, we’ll join the locals to swing burning bales of rice (no joke!) at the Hiburi Kamakura Festival! Ever wished you could party in an igloo? Here’s your chance! We visit Yokote’s Kamakura Festival today, where the locals will invite you inside giant igloos for snacks, warm drinks, and socializing among snowbanks illuminated with thousands of candles. Along the way, we’ll also visit the village of Omonogawa to sample some local treats and check out some traditional handicrafts. It’s time to hit the big city! We arrive in Tokyo today, and you have the day to do as you wish. Explore hip neighborhoods, shop for fashion in Shinjuku or Anime goods in Akihabara – or just unwind after the trek. As always, your guides will be on hand to help you make a decision on what to do. Time to return home and tell your friends about the trip!